another new shop opens in greenbelt 5! this time it's L manila and the L stands for lulu tan gan, the "queen of knits." 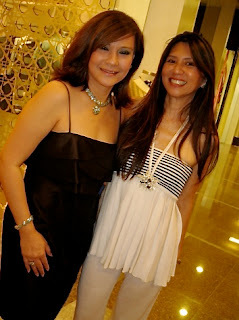 lulu is one of the more successful ready-to-wear designers in the philippines, which is the land of made-to-order. nothing wrong with that, in fact, a lot of our foreign friends are impressed that we can just visit our friendly neighborhood designer and have him/her whip something up for next week's big society bash, know what we mean? even better, some of us can purchase things right off the catwalk—that is, for the lucky ones who are model size (not us, boo-hoo). 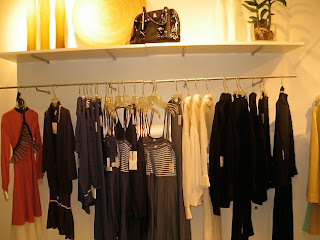 but with lulu's stuff, one shouldn't worry about that because they're all made with stretchy knits. perfect for travel as you can just roll it into a ball and toss it into your suitcase. not to mention, they're quite versatile. especially when in neutral colors. 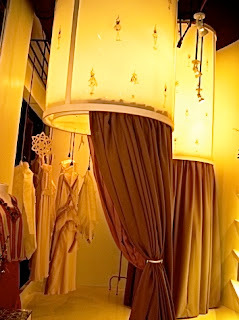 L manila also sells collections by other designers like tippi ocampo, arcy gayatin, puey quiñones, and more. check out the lovely fitting rooms... here's lulu (right) with a guest. doesn't lulu look great!? the woman is ageless and is an endless bundle of energy PLUS she's got great legs—wish she wore her signature hotpants! we didn't get to check lulu's knits, but the cocktail dresses were priced from about P7,000 to P20,000. quite pricey but it must because of the material used.